Six years ago, the Voyager 1 spacecraft informed scientists that it had become the first man-made object to enter interstellar space. Now, Voyager 2 has begun to return signs that its own exit from the Solar System could be coming soon. Two of Voyager 2's instruments have measured an increase in the number of high-energy particles called cosmic rays hitting the spacecraft, according to a NASA release. Scientists think that the heliosphere, the region of particles and magnetic fields under the Sun’s influence, blocks some cosmic rays. An increase in their rate means that the probe could be nearing the heliopause, the heliosphere’s outer boundary. Voyagers 1 and 2 launched in 1977 in order to explore Saturn and Jupiter. Voyager 1 then embarked on its mission out of the Solar System, while Voyager 2 was able to return data on Uranus and Neptune before starting its own decades-long journey. The probes made discoveries, returned important data, and presented iconic images of the outer planets. Scientists still operate the probes 40 years later, though the missions have changed—now, the spacecraft explore the Solar System’s limits, periodically sending back data via radio waves. Voyager 1 measured an increase in cosmic rays back in May 2012 before crossing the heliopause three months later—a measurement accompanied by a sudden increase in the density of the ambient plasma. 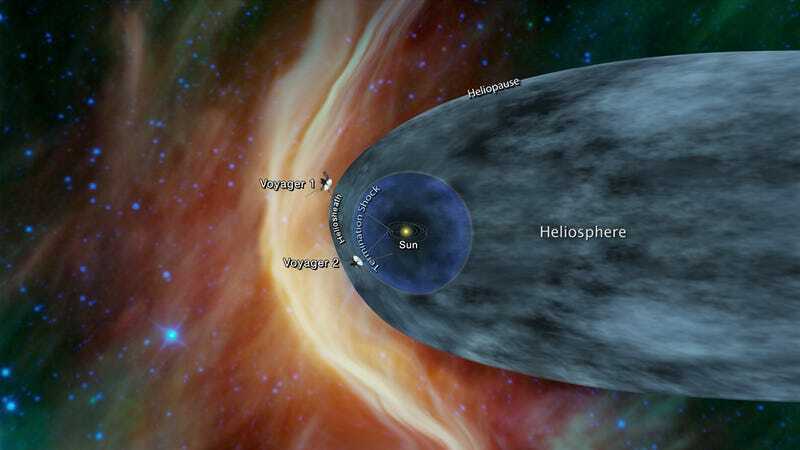 Perhaps Voyager 2 is now getting close, too, though one Princeton scientist who uses Voyager data, Jamie Rankin, stressed to Gizmodo that Voyager 2 hasn’t yet reached interstellar space. It’s tough to say whether Voyager 2 will leave the Solar System soon. But it’s another reminder of how incredible these missions are. Voyager 2 is currently 11 billion miles from the Sun, 118 times the distance between the Sun and Earth. Voyager 1 is over 13 billion miles from the Sun, which is 144 times the Sun-to-Earth distance. Yet they can still send us interesting scientific results, and yes, explore space even beyond the Sun’s influence. Who the Hell Can Understand the Voyager Disc&apos;s User Manual?